Public Works includes streets maintenance and sanitation services. The city of Walhalla offers curbside pick-up for the recycling of mixed paper and aluminum cans. Contact the Public Works Department (638-4351) for more information or to get your recycling rollcart and your individual pick up number. The City of Walhalla encourages you to recycle glass, plastic, cardboard, and tires at the city sanitation department or Oconee County manned convenience centers. You may also drop off aluminum cans and newspapers at one of the following recycling centers within the city limits: Walhalla Post Office or the City Parking Lot (beside Club 221). 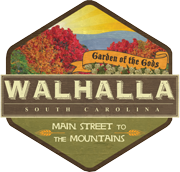 Do your part to make Walhalla GREEN! Only aluminum cans (soda cans, etc. No vegetable or soup type cans) can be recycled and all cans must be placed in a separate trash bag. Bags should be placed at the curb and may be placed alongside your paper recycling cart.